In 1927, the Cecil Hotel (currently known as Stay on Main) opened with initially 700 rooms decorated in Art Deco style, intended to attract and entertain businessmen. Located at 640 S. Main Street in Downtown Los Angeles, it wasn’t long before the hotel fell victim to the hard times that hit during the beginning of the Great Depression. Situated close to the nearby Skid Row, the surrounding area became populated with more than 10,000 homeless people living within a 6.4-kilometer (4 mi) radius. The local homeless situation was not the only problem the hotel would face. Stories of suicides, murders, and serial killers checking in for the night all turned this 19-story building into a place talked about more for its creepy history than hospitality. In its 90-year history, the Cecil Hotel gained a reputation for being one of the creepiest places to stay in the US—for very valid reasons. 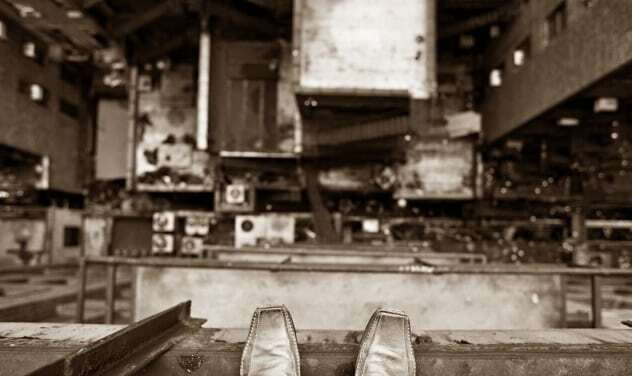 In 2013, 21-year-old college student Elisa Lam was found dead and naked in a water tank on the rooftop of the Cecil Hotel. Her clothes were found nearby. The gruesome discovery was made after guests complained about low water pressure. The coroner listed Lam’s death as an accidental drowning, but the events surrounding her final hours were so mysterious that they led many to speculate that something more sinister was at work. Lam had traveled alone from Vancouver to Los Angeles and went missing not long after she checked into the hotel. CCTV footage of Lam in the hotel’s elevator was released by the police, and her behavior was quite disturbing. She appears to be panicked as she pushes the buttons for several floors at a time and then leans her head out through the doors, looking for something unknown. She then hides in a corner of the elevator and even at one point appears to be talking to someone off camera. When the doors fail to close, she exits the elevator and does not reappear. Theories surrounding her death range from Lam being chased by a potential killer to her suffering a manic bipolar episode. 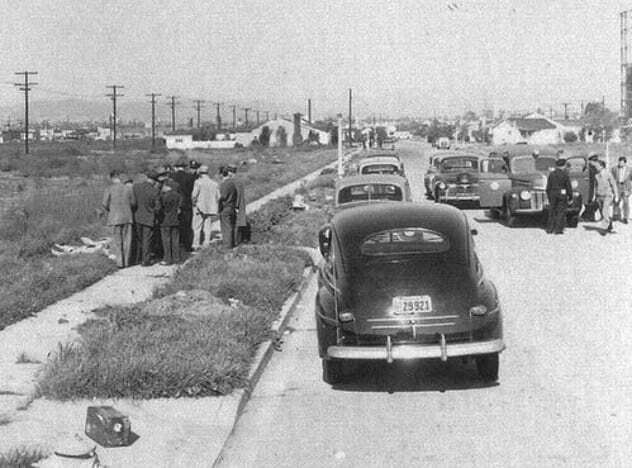 In 1947, a mother and her young child came across the naked body of 22-year-old aspiring actress Elizabeth Short in the Leimert Park neighborhood of Los Angeles. Short’s body was so badly mutilated that at first, it was believed to be a mannequin. She was cut completely in half at the waist, and her face had been cut from the mouth to her ears, creating an effect known as the Glasgow smile. The corpse had been thoroughly washed, drained of all blood and “posed,” with her hands over her head and the legs spread apart. Despite this brutal mutilation, there was not a spot of blood at the scene, and the killer was never caught. It is believed that Elizabeth was seen at the Cecil Hotel not long before she was murdered. She wanted her big break in Hollywood and was well-known for frequenting bars where she met with producers who could secure her a movie. Instead, she became famous for very different and sinister reasons. 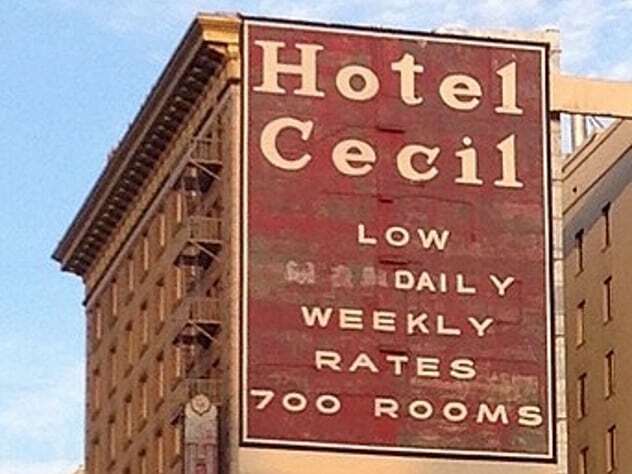 During his sadistic killing spree, Ramirez reportedly often stayed at the Cecil Hotel. Rooms were just $14 a night back then, and the area around the hotel was known for being a popular hangout for junkies, so Ramirez stalking the streets late at night would not have caused too much suspicion. He died on death row at San Quentin Prison aged 53 years old in 2013. Austrian serial killer and journalist Jack Unterweger was a guest at the Cecil Hotel in the early 1990s. Unterweger murdered 11 prostitutes in Vienna, Prague, and Los Angeles, often by strangling them to death with their own lingerie, between 1990 and 1992. 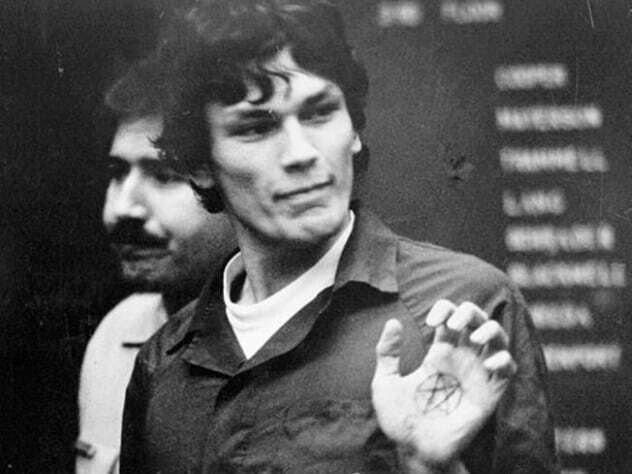 His first murder was in 1974, but he was released as a successfully “resocialized” prisoner. Unterweger stayed at the Cecil Hotel while he worked for an Austrian magazine writing stories about crime in LA. He could use his status as a reporter to secure rides with the LAPD and drive around areas that would soon become crime scenes of his own making. The method in which Unterweger strangled his victims—using a distinct ligature—tied him as a prime suspect to three homicides in the LA area, and he was eventually arrested in Miami. In 1994, in Austria, he was sentenced to life in prison without possibility of parole. On the night of his sentencing, he hanged himself behind bars, applying the same knot that he used to strangle his victims. The unsolved murder of “Pigeon Goldie” Osgood still haunts the Cecil Hotel to date. Retired telephone operator Pigeon Goldie was a recognizable face around the hotel, as she protected and fed the local pigeons at nearby Pershing Square. In 1964, she was found dead in her room at the hotel—she had been assaulted, stabbed, and strangled. In the ransacked room, police found her Los Angeles Dodgers cap and a paper bag full of birdseed. One suspect was arrested, 29-year-old Jacques B. Ehlinger, who was seen walking through Pershing Square wearing bloodstained clothes. He was charged for the murder, but later, his name was cleared. This was the last widely reported death at the hotel until the body of Elisa Lam was discovered in 2013. One of the strangest deaths at the Cecil Hotel was that of 65-year-old George Gianinni. In 1962, 27-year-old Pauline Otton was arguing with her estranged husband in a room on the ninth floor of the hotel. After Otton’s husband left, she wrote a suicide note and jumped from the window to the pavement below. Unluckily, Gianinni was walking directly below, and Otton landed on him. They were both killed instantly. When the police first arrived at the crime scene, they initially thought this a double suicide case, however, Giannini still had his hands in his pockets, which was inconsistent with a nine-story fall. After much police work, the truth was discovered that this was in fact a suicide that had caused an accidental death. Tragically in 1944, one of the youngest victims at Cecil Hotel had their life taken from them. Dorothy Jean Purcell, 19 years old, was staying as a guest at the hotel when she threw her newborn son from a window. Purcell did not know she was pregnant and woke in the middle of the night with stomach pains when she was sleeping next to her partner, 38-year-old shoe salesman Ben Levine. Not wanting to wake Levine, she went to the bathroom and delivered the baby herself. Purcell believed the boy was dead, and that’s when she got rid of the body from a great height. The lifeless baby was found on a roof adjacent to the building. Purcell was arrested, but after psychologists determined she was “mentally confused,” she was eventually found not guilty by reason of insanity. In 1931, a guest, W.K. Norton, 46, was found dead in his room after eating poison capsules. Although this was the earliest case of suicide at the Cecil, it would not be the last for that decade. The following year, 25-year-old Benjamin Dodich was found by a maid in a room, dead by a self-inflicted gunshot wound to the head. In 1934, former Army Medical Corps sergeant Louis D. Borden was found with his throat slashed—he had written several notes about suicide while in the room. In 1937, the body of Grace E. Magro was discovered wrapped in the telephone wires after she jumped from a ninth-floor window. A year later, the body of 35-year-old US Marine Roy Thompson was found on the skylight of a nearby building after he also jumped from his room. In 1939, Navy officer Erwin C. Neblett was found dead after ingesting poison; he was 39 years old. The deaths were just a few of the suicides that occurred during the Great Depression. Tens of thousands of Americans took their own lives during the late 1930s, creating the highest-recorded level ever—more than 150 per one million annually in 1937 and 1938. 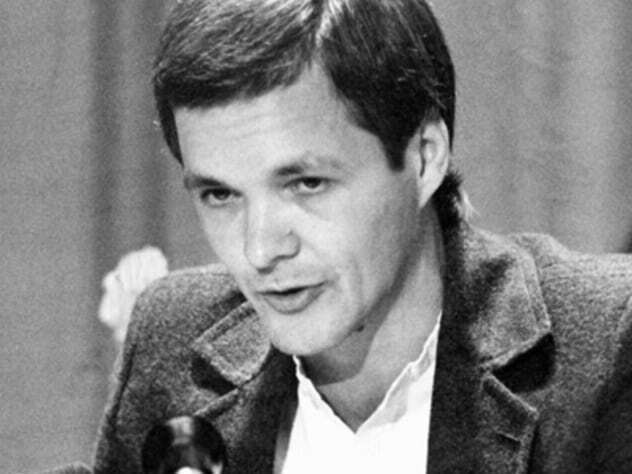 In 1976, 26-year-old Jeffrey Thomas Paley purchased a rifle, climbed to the rooftop of the Cecil Hotel, and fired 15 rounds at the street below. Shortly after the shots were fired, Paley was arrested. Luckily, nobody was injured by the gunshots. After his arrest, the former mental patient claimed he never intended to harm anyone; he just wanted to prove how easy it would be for someone—even a person with mental health issues—to purchase a firearm. This would not be the first time police had to respond to a potential killer at the Cecil Hotel. In 1988, 28-year-old salesman Robert Sullivan was arrested at the hotel when the body of 32-year-old nurse Teri Francis Craig was found at the home she had shared with Sullivan for seven years. Sullivan was just another name added to the last of cold-blooded killers who have checked in at the hotel. One of the more recent creepy events to take place at the Cecil Hotel was when a young boy from California captured a ghostly apparition on camera in 2014. The picture appears to show a transparent figure standing on the ledge outside a window on the fourth floor of the building. The photo was soon picked up by several news outlets, the possible ghost being quickly linked to the gruesome past of the Cecil Hotel. The young photographer told reporters, “When I looked at that window, it just looked kind of creepy to me, and then I showed my friend, and he kind of freaked out. It just creeps me out still.” He also claimed that the photo was causing him many a restless night. The hotel has long been considered one of the most haunted in Los Angeles, which attracts ghost hunters and morbid seekers all throughout the year. Many of the hauntings are believed to be linked to the high number of suicides that have taken place within the Cecil’s walls, as the souls of the spirits have been unable to move on. Read about more creepy things that have happened at hotels on 10 Grisly Hotel Homicides That Are Still Unsolved and 10 Creepy Hotel Mysteries That Are Still Unsolved.